Once upon a time, a young woman named Goldilocks wanted to refinance her mortgage. She visited a website she saw advertised on TV and filled out a form for a rate quote. Some she received were too big. Others were too small. One was just right, so she allowed the website to pass her information along to the lender who offered it. But Goldilocks didn’t live happily ever after with her new, lower-rate mortgage—at least not until several painful months had passed. The website sold her name and phone number to other marketers as well, and within days, she was fielding dozens of unsolicited calls. The lender she selected asked her to submit her information again, lost her supporting documents multiple times, and demanded she perform financial miracles before the close of her loan. Too bad Goldilocks didn’t know about Lenda. Named one of NerdWallet’s Best Mortgage Lenders of 2018, the company offers borrowers a straightforward, streamlined, and transparent mortgage experience at a lower cost than traditional lenders and with a process that is entirely digital. RewardExpert spoke with Jason van den Brand, Lenda’s founder and CEO, about the many factors that differentiate his San Francisco-based company from other online mortgage lenders. After assisting thousands of homeowners with purchase and refinance transactions, van den Brand also heard complaints about the reams of documentation required for most mortgages as well as the lack of transparency around rate quotes and closing costs. Though the technology he created with co-founder Elijah Murray was originally marketed to Millennials, a group van den Brand felt would be more responsive to the digital nature of the product, he broadened his advertising scope to older generations after a Thanksgiving trip to visit family in Philadelphia. Whether you’re planning to buy a home or want to refinance your mortgage, it takes less than one minute to get a rate quote through Lenda. In the case of a purchase, you’ll enter basic information about the home price, down payment, and your estimated credit score. If you’re refinancing, you’ll choose a refinance purpose—such as lower rate, pay off faster, or get cash—as well as plug in basic data about your current home, mortgage balance, and your estimated credit score. Each rate quote includes upfront information—in an easy to read format—about the closing costs you may incur with the loan from points (to reduce your interest rate) and third-party service fees to government fees and taxes. Because Lenda is focused on efficient mortgage operations, they never charge application or underwriting fees. Lenda will pull your credit report for free and provide you with your credit score. The company’s sophisticated technology will then further analyze your application in conjunction with the credit data to determine the additional documentation you’ll need to provide. All mortgage forms, from government-required disclosures to closing documents, can be signed digitally online. And every step of the process can be completed at a time convenient to the borrower, 24 hours a day, seven days a week and 365 days a year. Loans originated through Lenda typically take 25 days to close. Lenda currently operates in Arizona, California, Colorado, Florida, Georgia, Illinois, Michigan, Oregon, Pennsylvania, Texas, Virginia and Washington. The company plans to offer mortgages in additional states soon. 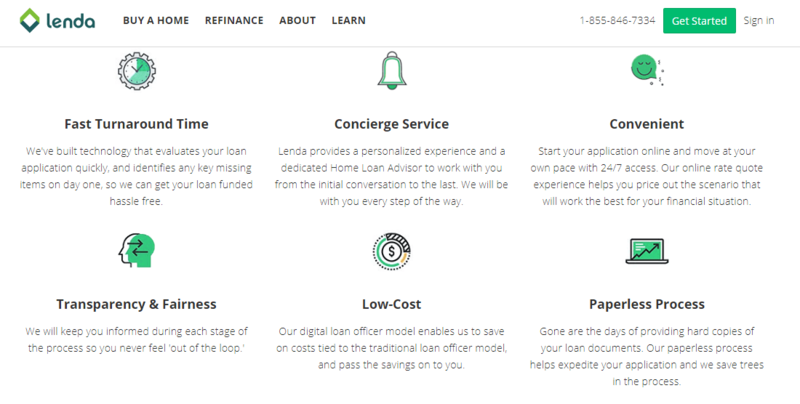 To learn more about Lenda or request a rate quote, visit www.lenda.com.